The implausible versatility of a silk sarees makes it must to have collection for every woman. Pothy's selection of silk sarees is a salutation to this and showcases some of the beautiful hand picked designs out there. From Kancheepuram silk to Benarasi silk to the traditional Varanasi silk we are a notch above the rest to make you best at a festive event. Celebrate your anniversary by going slightly overboard and choose a silk saree that makes a statement. Make sure to remind your better half how lucky he is to have you in his life. Be gracious and elegant and simply up your feminine appeal with our collection of silk sarees. Choose over a silk saree over normal attire and be the talk of the event. Colors add essence to a design and choose the saree with a design pattern that suits your gathering. Pothy's silk sarees online offers the perfect mingling of tradition and trend. 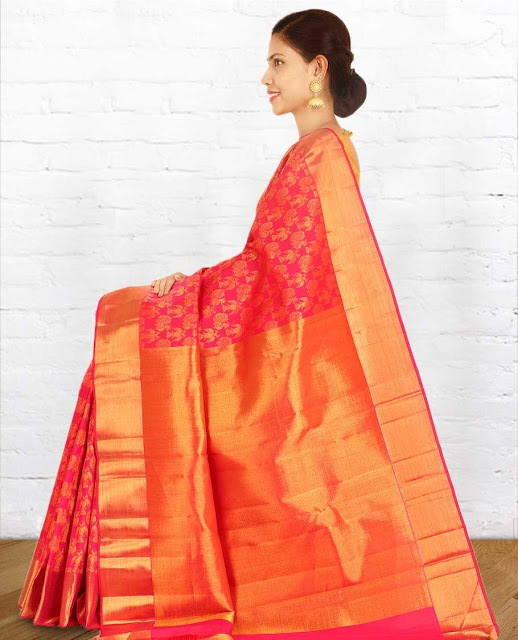 Not to forget the latest in fashion and the current trends to choose over in our silk saree themes. Be it a party or a special occasion or a simple office gathering, make eyes meet and approve of your style quotient and wait for the admiration. Take your pick of colors to suit the occasion and have fun matching them with the bracelets and earrings. Pick out silk saree combinations that are feminine and easy to add the side frills. Treat yourself with one of our fabulous offerings of the Kanchipuram silk sarees world and watch the world go crackers about you. Breathe life into the wardrobe and simply make a fashion statement from the air. I would like these kind of silk sarees!